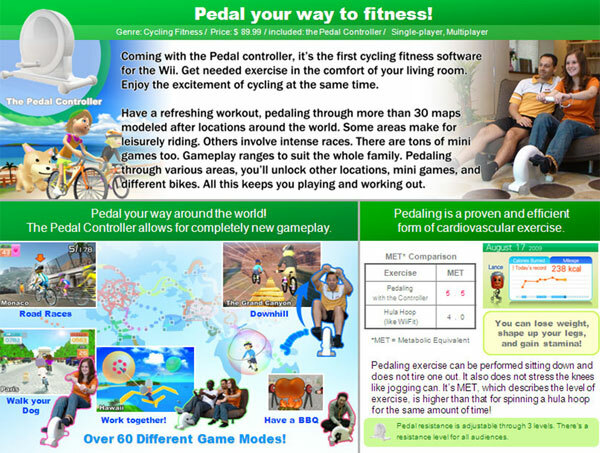 Is the Nintendo Wii going to get a recumbent bike peripheral sometime soon? From the looks of this leaked marketing slide spotted over on NeoGAF (along with another for a rumored Wii Fit Plus) it sure looks like a possibility. While it’s not clear if the image is from Nintendo or from a 3rd-party accessory maker, it definitely looks like something I could see hooking up to my Wii. The $89.99 controller appears to be a foot-pedal device that’s used to interact with a variety of bike-riding and fitness activities. My best guess is that the slide was leaked from some sort of Nintendo product focus group, and might not represent a final product. Still, I really love the idea that someday I may be able to participate in the Tour de France in my living room. It’s actually my life’s ambition to complete a triathlon without ever leaving my couch.